Ciscoe’s H2O 411 includes when, how much and how often your greenery needs a drink. PROPER WATERING is the key to maintaining a beautiful garden in the Pacific Northwest. Despite our reputation for rain, it’s feast or famine when it comes to precipitation. The vast majority of our 36 inches of annual rainfall occurs in the winter months, while in most summers we suffer drought conditions. Between the beginning of May until the end of September, we average less than 7 inches of liquid sunshine. Compare that to the approximately 20 inches of precipitation that falls during the same period in Wischeescin (where I grew up), and it’s apparent why we need to supply additional water to keep most plants healthy and attractive. One of the most important things you can do when it comes to saving water is to apply a layer of organic mulch over the soil surface at least once a year. As little as an inch of mulch keeps the soil surface 15 degrees cooler on a 90-degree day. Mulch not only slows evaporation, but also reduces runoff and increases absorption. If your soil is sandy and water tends to soak right in, divide the watering time in half, and water twice per week. If your lawn or beds slope, try the start-and-stop method: Run your sprinkler for about 5 minutes, just long enough to wet the entire slope. Then turn the water off for about 10 minutes to allow water to soak into the soil surface. Then water as you normally would. The amount of runoff should be greatly reduced. Whenever possible, water early, in the cool of the morning. Morning watering minimizes evaporation and enables leaves on roses and other plants to dry more quickly, thereby reducing disease problems. 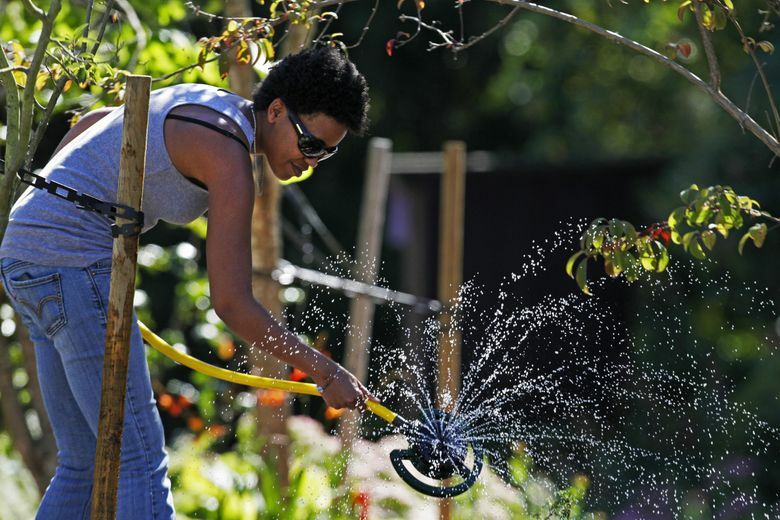 Where practical, use soaker hoses to water vegetable gardens and shrub beds. When using overhead sprinklers, adjust the settings to water only the bed or lawn rather than the sidewalk. As a general rule, it’s better to water deeply and infrequently. Light, frequent watering doesn’t tend to penetrate deeply and keeps only the surface moist, encouraging shallow rooting. Deep infrequent watering, applied slowly from a soaker, drip system or low-volume sprinkler, penetrates much farther down into the soil, fostering deeper rooting and increased drought tolerance. Finally, if you stopped watering your lawn, chances are the grass already has gone dormant. Once the lawn has turned brown, it’s extremely wasteful to water heavily to try to green it up until active growth begins again in fall. Normally, it won’t do any harm to let your grass remain dormant in summer, but if we experience an exceptionally hot and dry summer, the grass could literally die of thirst. If we don’t get any significant rain this summer, water your lawn at least once per month during July and August. Apply about 1 inch of water each time. Watering once a month is also advisable if you have trees growing in a lawn that was allowed to go dormant. Trees remain actively growing in the heat of summer and can be harmed if the soil around them is allowed to become bone-dry. Usually, watering once per month is enough to provide adequate moisture to keep the tree healthy and in better condition to withstand winter.